Derrick assures her she’s not the target. Victoria says BRittany has her way with words she’ll be able to pull herself off. Victoria – “I Do not trust Christine I can see right through her..” Victoria thinks it was Christine that got cody to put her up. Victoria mentions how COdy’s speech never made sense to her because of the conversations she’s had with him last night. Derrick you’re not the target,. you have the Battle on the block then the POV then nominations.. don’t say nothing bad about anyone because they’ll take that and use it against you. Victoria – I just feel like If I go home nothing will change in the game. She explains that she talks to everyone a bit so doesn’t impact on person game too much either way. He tells her if she doesn’t win Battle on the block and doesn’t win POV they will take care of it for her. All they need is 5 votes to tie and Frankie.Cody won’t vote you out. Christine brings up Victoria walking in on conversations all the time and Caleb called her out for in. Caleb says he’s telling him straight up he was taken a bit aback when they closed the HOH door on him and Christine he thought they were in the same alliance. Cody totally gets that says he told amber not to close the door. Caleb – Straight up I’m still trying to figure you out. They agree regardless of what Caleb did during last week’s Battle on the block they were not going to win because of Jocasta doing so bad. .
Frankie rolls in and starts venting about Brittany going on about deserving the money more because she has 3 kids. THey all agree Victoria doesn’t deserve to win not because she’s filthy rich but because she doesn’t play the game. Caleb says if Brittnay is low on money she should get some work. Caleb – “You’re rent is 3 grand live somewhere different” Caleb adds that his mom has worked in the same factory for 15 years. Frankie says Brittany’s strategy is to cry for her kids, She did it to Devin and got the Power of Veto after being his primary target. Brittany thinks the 8 people is still close and when they get to nominations they get together and not put each other up. Brittany points out that the two girls that don’t hang themselves off Coy are her and Jocasta. If she was younger without kids she would to Cody is gorgeous but her situation is different. “It’s a different mindset” Victoria understands. Brittany explains to her that last night all the girls didn’t want to sleep with her because she giggles so much so Frankie was going to get them to pick a number. Victoria says people are finding the stupidest reasons to have a problem with her. Brittany goes to the kitchen were Jocasta and AMber are. 2:07pm Kitchen Amber, Brittany, Jocasta and Victoria. 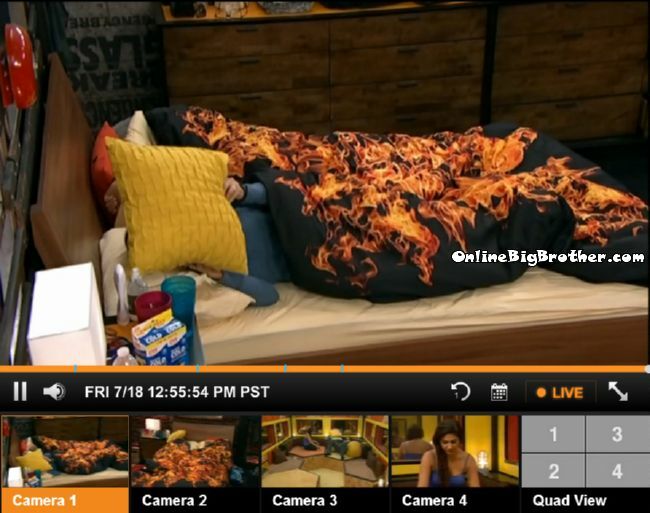 Amber points out some people in the house “Oh it was me” and they go back to bed. Brittany says she didn’t sleep once last night. Amber brings up what Zach said during the show last night. Brittany is upset by what he said she did his laundry. Brittany says Zach was sweet as pie to her and this week he just doesn’t acknowledge her. It was because last week was an easy week and they all knew who was going home. well they don’t think they have the power they KNOW they have the power. I agree with you though that they are way over confident but I feel like just because they are winning HOHs and competitions and stuff but the hate they are getting is kind of dumb because they are just playing the game by actually competing and getting out people who aren’t in their alliance. 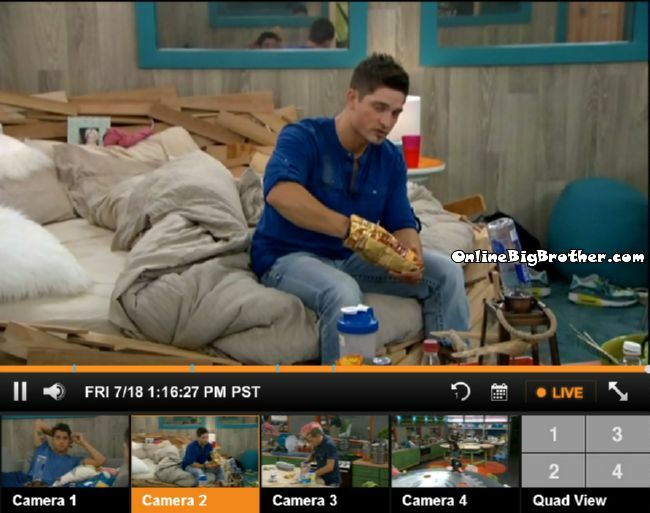 Caleb wins POV… Emphasis on the Caleb/ Amber relationship to see if he uses the POV on her. Maybe I can explain this so a man can understand it. You have a favorite baseball, football, or basketball team right. You want them yo win. You get tickets to go to the game (live feeds) you have been waiting for all year. Let’s use basketball (I’m a laker fan lol) Your team is beating the other team 95 to 20. Now, I’m i have fun seating in my seat at this point. It’s ok but I’m eating , talking, going to the bathroom, I don’t even clap after my team makes a point anymore. I even leave the stadium 10 mims. Before the game ends (I don’t watch BB on TV I rather read it on OBB in 5 mins) because I’m thinking of traffic. Now let my team be up 95 to 98 . Omg I’m a wild manic. My voice is gone. Team Derrick is up 95-20. It’s just a much better game when you have good talent all around. That’s why there is so much rooting got the underdogs because we are trying to fine something to make this crap worth watching. So that’s my reason for complaining. I agree with American deciding who TA needs to nominate. I still don’t see amber as the biggest physical threat. Donny is bigger (but TA), Nicole and Hayden. Frankie said if he wins he’ll use the money to build schools for children in Africa. so.. rich or not it doesn’t matter. just let the best man wins. Exactly. It’s a competition. Who needs the money most has nothing to do with it. This isn’t a charity. The person who deserves it most is whoever ends up winning, and that’s what Frankie was trying to say. I can’t stand Christine especially when she asked the guys who’s hotter Britt or Amber? Stop hating on Derrick,.he’s the smartest one in there. Derrick kinda reminds me of Amanda Zuckerman. Constantly talking (loves to hear himself talk) and everyone actually LISTENS! I don’t like him….and I definitely was an Amanda Hater. Too much power in one place. Amanda was one of the best players ever, like her or not. Derrick is just someone that we won`t even remember his name after the show is over. Things will never change in the house if Victoria goes, hahahahahahahhahaha. That is as good as Jocasta saying they aren’t catty and then talking about Victoria in the next breat. It’s amazing how unaware they are of themselves. Brit needs to stop whining and play to win the BOB (hard with her partner, but they have a 50/50 shot) and for the POV. Yes, but you have to give Jocasta her props. When Zach called Vic the B word and said he’d like to rip out her tongue.. She confronted him. She scolded him and told him she could not vote to save him because he spoke to women that way. She voted for POW…Vic didn’t. She told Jo she was really upset…BUT Vic got over it called Devin a bully, Donny a pervert and now….she’s shocked that people talk about each other. like her or not victoria has a point. ..actually she has a couple points. 1. people find the stupidest reasons to hate her. okay she’s not the greatest game player but i’ve yet to see her do anything to deserve these numerous sessions where everyone gathers together and just relentlessly bash her and tear her apart. Caleb would wreck Cody in a fight, I guarantee it. You can tell from his build and temperament that he has serious punching power and can take as much as he gives. Cody would be too worried about his pretty face to get down and dirty. Cody was crying because Devin stretched his t-shirt, week two. He’s a pu$$y. All looks, no balls. I agree that Caleb needs to be taken care of, but like Devin, you can’t give Caleb two chances to win his way off. but they aren’t trying to get rid of her. you have to nom FOUR people. she is considered rather useless and no one wants her for comps in BoB, I don’t understand the confusion here. you think they should have kept her off of nominations? Why? because she does absolutely nothing? ok.
Victoria is super irritating. The other day Nicole and Donny did the dishes for and hour and a half because people left so many dirty dishes out. Later that night, Victoria got out of bed, ate a bowl of cereal, and then just left the bowl of milk out of the counter when she was done! I mean this whole bedgate argument between Nicole and Brittany is because no one wants to sleep with Victoria. It might not change anything in the game, but Victoria is getting on everyone’s nerves. Even Jacosta is throwing shade her way. gosh I wish people would explain a negative vote instead of hiding behind having absolutely nothing to counter it. I don`t get why CBS always chooses girls that are physical stronger. Do you watch the MTV “The Challenge” ( Real World)… all those girls are probably stronger then Devin and Caleb together. CBS this season was hopping for showmances. That`s why they got girls like Amber and Nicole. You are absolutely right! And if we are comparing intelligence and beauty, I would put Laurel or mtv’s Devin up against Brittaney or Amber and watch mtv’s ladies wipe the floor with BB’s picks. I don’t think you realize just how strong Devin actually was, if you actually believe that. Very well put, I conquer !!! Whats the deal last night with Brittany and Nicole sleeping beef? Well hopefully one of these girls win HOH next week and put up the guys on the block I would love to see Derrick on the block with Cody just to see how they react and see how low they go to save themselves. Christina and Zach love talking bout Victoria but last time I checked they all in the same boat game wise aint won anything just trying to ride some ones coat tails to the end. if you watch feeds, you appreciate how quickly he was after cody/Frankie for the nominations. he had the 4 picked out before they had the HOH rooms ready. Victoria doesn’t talk game, she doesn’t seem to get the game. Up until now Cody hadn’t won anything and Hayden only won BOB. Zach came in second on the spelling veto, second on the planet veto (I count Zach not Derrick because Zach got to one planet WAY first, but then lost them all, Derrick did the same, much later), and he and Amber were second in HOH. He also gave Derrick the strategy he won HOH with and he and Amber figured out a strategy before Jocasta and Brit… Even though they were the ones Derrick told Frankie and Cody to copy. I would love to see Cody x Derrick on the block also. Maybe next week Britanny and Jocasta wins. Cody is really starting to get on my nerves…he was my favourite player but is becoming annoying fast. I like botb this year because it keeps weaker players on the block. Brittany and Amber back-stabbing Donny. Funny conversation between Britt and Vic, if you could call it that, Britt just whining and ignoring everything Vic saying. Hope Jocasta goes to Donny and tells him the crap Britt and Amber conjuring. Done with Britt and Amber. Donny needs to be picked for Veto and go Beast Mode. Otherwise, it’s looking pretty grim for the ex-Navy Seal/MIT Grad/Groundskeeper. Hoping Hayden doesn’t do Don dirty. OMG! I must have missed that! What did Britt & Amber say about Donny? SO true! Don’t those girls realize the sooner other girls get evicted, the sooner their own number comes up? Do they really think the guys are just going to let them coast to the end with them? Yeah right. It’s time to wake up Nicole and Christine. I feel like the girls are SO disappointing this season, all of them act like they don’t even have a mind of their own…. Brittany and Jacosta sometimes act like they do, but not enough. Victoria just wants to hang around and not play the game. Why not put her up. She has 2 chances to get herself off the block. Zach is easily the most entertaining HG. I wish Cody would stop freaking out whenever he makes a comment. 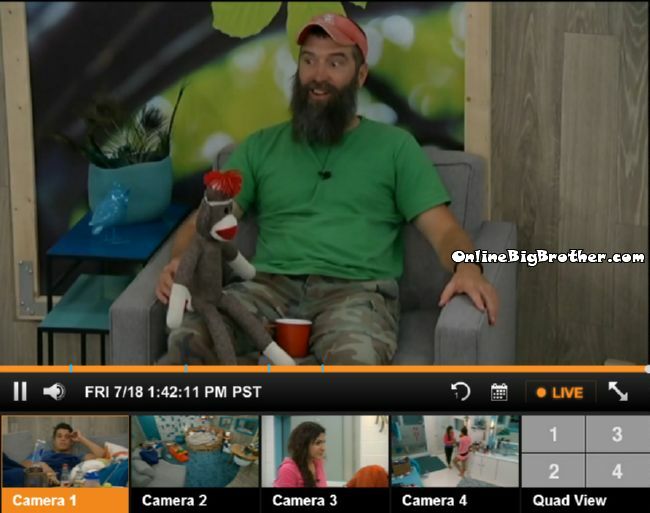 Zach brought up his “I hate you all” type comments when Julie asked him the question, and cody said it was bad for his game in front of everyone. they need to let that stuff go. Zach Attack is a complete maroon who says over the top ridiculous things. but that is who is he and that is his game. if you seriously thought what he said was bad, you are a weenie, and cody has been a bit of a weenie lately because he wanted to hook up with brit. 100% agree with you about Zach. At first, I didn’t care too much for him but he’s definitely become a favorite of mine along with Donny. I like that he’s not afraid to do a little mischievious s**t-stirring from time to time. Can you imagine how boring that house would be without him? One other thing: These girls are playing a DUMB game! POV Donny gets picked to play wins and uses the Veto to save Jocasta once again Cody backdoors Calib and puts him up. Now the house has to vote between Calib and Amber Calib goes nuts they vote out Calib next Thursday the four girls(Brittany,Victoria,Jocasta,Amber) wake the frak up and align with Donny,Hayden and possibly Nicole. Form the “underdog” alliance and target Derrick,Cody,Zach,and Frankie as the evil in the house to be exterminated. If Brittany/Victoria win, Frankie is HOH as Cody nominated them. And I don’t know why everyone is calling Frankie as one of the evil in charge. No one seems to trust him or tell him much of anything. I don’t know. If Frankie has to renominate, who would he pick? Sounds familiar oh yea…. the same thing happen with Devin. I think it’s past time for the girls and I blame Christine and Nicole. Christine because she’s supposed to be a BB superfan and she knew from the beginning the fratbrats were going to pick off the girls and Donny one by one. Instead of working to create an opposition alliance she roped in Nicole to do whatever the fratbrats want. Two women who are supposed to be superfans and they’ve thrown away any chance of winning. That`s why I don`t get why people hate Brittany just because she never watched the show. Brittany is doing 100000000000000% better than Nicole and Christiane together. Watching the show is overrated. Dr. Will is arguably the best player and he was in season 2, so he could have only seen one season at most. It has more to do with natural smarts and common sense than anything. As well as having the balls to make the right move. I am soooo disappointed in the ladies! Why can’t they see they are going to just sit there and get picked off one by one if they do not unite with Donny and Hayden. The men have their ups and downs and personality clashes but they know it is a game they need to be playing. Derrick, Zach, and Cody are the best players in the house that is why they have the power. Because they play!!!! People should stop hating on them because they are good at the game! I don’t get why everyone hates them so much now when they didn’t before?? I love them and will root for them all season! Derrick is the dangerous one. Frankie/Zach/Cody wanted one thing, Derrick wanted another, Derrick got his way. Caleb/Frankie wanted Caleb in HOH, Derrick was there instead. Derrick is getting whatever he wants which is smart until he makes himself a target or turns into Devin. I thought Frankie was the manipulator. I dont want to see Caleb or Amber leave just yet because I love seeing Caleb who thinks he’s GOD’s gift to the entire world be rejected repeatedly and walk around pouting like the little b!tch that he is. I love to watch this narcissistic pri¢k walk around sulking 24/7. I can watch that all summer long. Pahaaaa. Prefer the OZ nominations where housemates nominate each other for so many points and then the public votes for evictions based on the 3 hgs with highest number of points. 1. Victoria should realize Frankie has other plans that do not include her. 2. Brit needs a reality check when it comes to being best buddies with Cody. 3. Jocasta needs to realize she needs people and not just God in this game. 4. Amber should wake up that the remains of BombSquad does not include her anymore. Why o why can’t these girls, not women, girls see they have enabled these guy to run the show. If they had been smart they could have neutralized Cody, Zach, and Caleb (I’m a BM cowpoke) and Hayden. Then used them to take out the rest of the guys. Then roped in Frankie and Donnie. People always talk about men being lead around by their privates, but these girls show amply, why it is usually the girls being lead around on these type shows. I hope they get picked off one by one. And I don’t really care which guy wins. It’s not like last season when each was more vile than the last. The guys all seem nice enough. They are just playing a better game than the girls. Instead of them talking about a ladies trip, why don’t theses women come together and try to win this thing….Fools! OMG something is really wrong with cowboy his starting to sound like a stalker if he was dating someone I knew I would say run run far away .OMG and he is so looking stupid .OMG stop dude just stop and go get help .. WHAT?????? AMBER CAN’T TALK ARE BE AROUND ANYONE BUT HIM.. GET HELP.